This Malibu was in for some significant audio upgrades, but one of the main concerns was the lack luster performance from the factory woofer. The OEM installed Rockford Fosgate Marine 12" woofer, is actually a quality woofer and can sound pretty good! The issue is, with the factory build enclosure. It has 2 main failures. 1, it leaks air like sieve and 2, its too small even if you fix the leaks. Ive seen some so bad, you can see daylight through the seams. You can see below, the owners past attempts to seal the old enclosure. OEM enclosure is about .7 ft3 prior to the woofer going in. New enclosure is 1.1. Does not sound like a big difference, but it actually is. A small change in the air volume impacts the woofer's sound and performance. Think about the thickness and tension of the strings on a stringed instrument. You can tune the woofer but adjusting the internal air volume. So we spec out a new custom enclosure that larger, and of course, air tight. We mate it to the original facade and only end up moving the facade out about an inch. Ends up looking completely original, but the improvement is huge. In this particular build, we had the advantage of freeing up the factory 500W 2 chnl tower amp. So we pulled the original 300W woofer amp and repurposed the 500W to the woofer. So we also gained some wattage performance. Trifecta! This setup started in about 2012 or 2013 and was found on the traditional nosed boats. 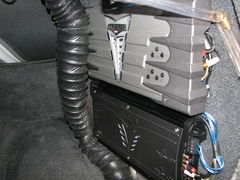 On the MXZ's, they just front loaded the woofer to the plastic foot well, and run the woofer free-air. Equally poor execution. These boats also benefit from a custom enclosure. For most Moomba owners of the past 6-7 model years with OEM woofer option, by far, the biggest complaint is the lack luster woofer performance. Sadly, its the woofer, mainly the brand, that gets the bad wrap. In reality, its the choice of Moomba, to cut a corner. The Kicker KM10 woofer is NOT a true infinite-baffle/free-air woofer, meaning, it works best with a small enclosure behind it. Moomba chooses to load it through the under helm facade, with no enclosure structure behind it. Further more, the facade is not even a complete wall. Its actually open at the top! This allows output off the back of the driver, to flow over and meld with the output off the front. This creates phase cancellation issues. This makes tuning correctly, nearly impossible. Sound quality and performance will suffer. It can also be detrimental to the woofer, leading to a mechanical failure and short life. The fix: small sealed or ported enclosure back loaded behind the facade and a proper amp tune. You can comfortably fit a small sealed enclosure between .8 and 1.0 ft3, depending on year, model and options, under the helm. The boat will retain the factory look with little no loss of leg room. The original facade is retained, with little modification. A larger ported enclosure will require more design and fab time, and result in some loss of some leg room under the helm. Installing an enclosure makes a world of difference in both sound quality and output. Construction finished, ready for sealing. Finished enclosure installed and facade and woofer back in place. 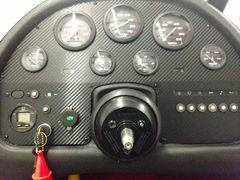 Also installed a Fusion MX-NRX300 transom remote and N2K Backbone to support it. Since the boat had a Wet Sounds RGB controller installed aftermarket by dealer, we wire the Kicker KM10's RGB LEDs to the controller. 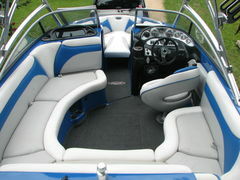 That is the bimini from Monster, but its actually made for them, but now I cant remember the name on the tag. This boat came into the shop with only a single battery but two ON/OFF switches. As we dug into the project, it seemed that this boat did at one time, have a 2nd battery. Somewhere along the line, it was consolidated to a single battery, which happen to be a deep cycle. 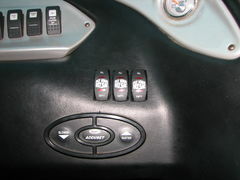 Even then, the twin ON/OFF switch was a strange configuration, even back in 07. Dual bank switches are not new by any means. We removed the old twin switches and installed a new Blue Sea 1/2/BOTH/OFF switch. Removed some of the extra, unneeded cabling. Relocated ALL the B+ load supplies to the switch output. Built new 1/0ga ground link cable between the banks and a new 1/0 B+ supply from the battery to the switch. New group 24 box and Interstate marine cranking battery. One main switch turns the boat off when out of use. Operator can decide which bank to draw from, whether cruising or at anchor. One bank can always be kept isolated in reserve and both banks can be charged while the engine is running. The 07 Centurion Avalanche has a 3 hard tank setup that uses a common impeller pump to fill each tank through a set of 3 sprinkler valves. First step was to remove the engine dividers and engine hatch supports. Remove the hard tank covers and hard tanks. Remove the sprinkler valve assembly and all the fill, drain and vent hosing. Reroute belly tank fill hose from sprinkler valve to outlet of original impeller fill pump. Cut to length and connect to pump. Beyond this, everything else remains as is for the belly tank. Faster fill rate now with the original fill pump dedicated to the belly tank. 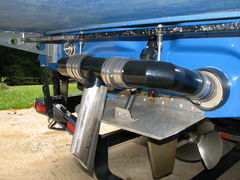 We recycled the hard tank covers and built covers for the side swipe exhaust. 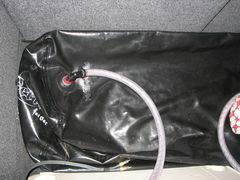 This concealed them, created a divider between the exhaust and sacs and provided a perfect spot to mount the 2 new pumps. New plumbing required a new thru-hull setup for one rear pump and a T off the original for the belly and one rear pump. The hard tanks had a drain and vent thru-hulls. We capped one and retained the other as a vent for the new sac. New .75" hose for the vent lines and 1" hose for the fill/drain lines. New 12/2 cable run from each new pump to the helm for the pump electrical. 2 new DPDT Carling switches for the new rear reversible pumps, but retained the original switch actuators. 10GA inline fuse holders and 30A fuse connected to the helm BUS supply. Switch ground to helm ground BUS supply. 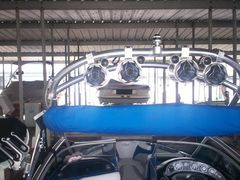 So we pulled the original Evolution tower and installed a new Monster MTK tower w/swivel ranks and bimini. We made use of a couple if the exposed holes from the old tower, with the front tower feet and anchor light fitting. Tower placed placement was key. The old tower swooped back, the new tower swoops forward. We needed the bimini to give good coverage of the main cabin, yet try not to move the tower tow point too much from its original center of gravity. This required moving the "Centurion" gunwale plates back about 6" and re-drilling a few new holes. An inlet per pump is not needed, as its all about the flow rate. A 1" can easily supply two pumps and a 1.25" can support 3 pumps. I go with individual thru-hulls only when it makes the install easier. Sometimes a single manifold is too large to fit, so we do need to break the pumps up and spreads them out. You might see some air lock from those pumps above. I would suggest rotating them around so the outlets are up. BEP as in BEP Marine. They call it a VSR, while Blue Sea Systems and others call them ACR. In the end, they all do about the same job. As long as there is voltage above normal static (at rest) battery voltage, the ACR/VSR will close/combine, allowing that voltage to contribute to the other bank. As stated, this is voltage above normal battery voltage, so its alternator charge. In this scenario, its not the charged battery pouring into the undercharged battery, but rather the alternator's charge. When there is no charge, or in other words voltage thats not above an at-rest battery, the ACR/VSR will open, isolating the main from the house. The ACR will not "cause" the charged battery to charge into the other one. In reality, the purpose of the ACR/VSR is to prevent just that. Heck of a project for sure. Not sure which ones you've used that do this. 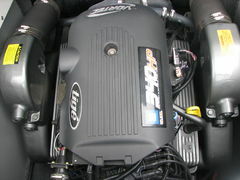 The Blue Sea, BEP and Surepower units do not. The DCP switch is ON when you hop in the boat and OFF when you leave. No switching while on the lake, no remembering to switch while on the lake. I did not make it to IBEX lat oct or CES this jan, so I have not gotten a demo. But if the KMTC11 had been available, pretty good bet I would have used them in this upgrade.